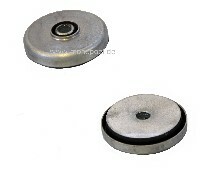 Rubber bushings for the rear attachment of the differential to the rear axle frame, set consisting of two pieces. The rear differential is attached to the rear axle frame with two screws and two rubber-metal bearings. The bearing bushes are always worn out, which can cause vibration/drumming in the drivetrain. When removing the differential, the bearing bushings should always be replaced. For a differential 1 x rear differential bearing set and 1 x front differential bearing set is required (w124-dl-v-set).